When planning a wedding, every decision can seem monumental. Even picking a wedding cake can be a defining moment for the bride. 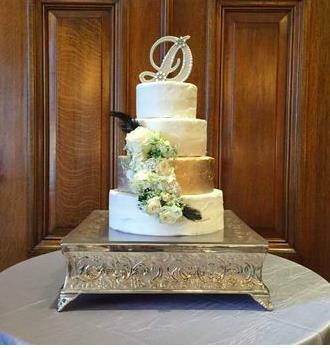 Many see the wedding cake as a reflection of a bride’s taste in dessert, decoration, and presentation. 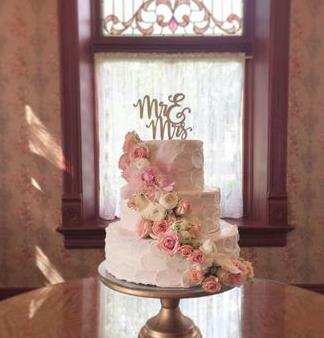 It can be hard to pick a wedding cake considering there are so many flavors, frostings, decorations, and looks available. Not only this, but you also have to keep those who are attending the wedding in mind and ensure that the cake you choose will be something they prefer to eat. In an earlier blog post we talked about the naked cake trend, however, in this blog post we want to dive deeper into the many options you have when picking a cake. The naked cake trend is beautiful but there are many options for cakes if the naked cake isn’t your favorite. 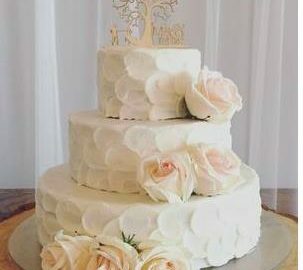 This being said, Salt Lake Bride has done its research and provided brides with a great list of cake options to help make this decision easier. In this article, we are highlighting one cake company, My Sweet Cakes, in order to discuss flavor options and appearances of cakes. However, on the website, we have included multiple cake companies, all of which ensure you will get the cake of your dreams. The company we are discussing, My Sweet Cakes, provides consumers with a list of flavors on their website that highlights the many options you have when picking a cake. Their range of flavors includes the simplest of flavors, such as, chocolate, vanilla, strawberry, and ranges all the way to more creative flavors, such as, guava, éclair, apple, and pistachio. When picking a cake, you can go with the classic flavors, or if you are feeling adventurous, switch it up for something new. My Sweet Cakes has many options regarding the appearance of the cake. You can pick to do a 4-tier wedding cake, with a very elegant look (as shown below). This cake utilizes gold and flowers in order to give the cake a more classy, formal look. You can also choose to do a 3-tier wedding cake but still get the elegant look (as shown below). This cake includes textured frosting, a blush color, and blush flowers running diagonally across the cake in order to also give it the classy element while still remaining a smaller cake. Similarly, you could do a 3-tier, elegant looking cake, but focus on traditional white colors rather than blush. 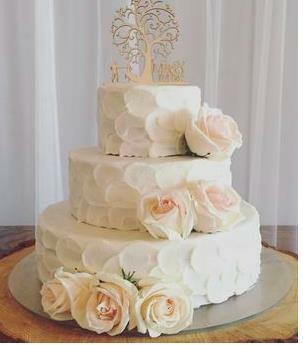 The cake below has similar elements as the one above, however, it uses white frosting and deliberately placed flowers in order to give it a unique look. The texture of the frosting also gives the cake a really unique, beautiful look. My Sweet Cakes also highlights a beautiful way to do a 2-tier cake. Shown below, is a 2-tiered cake that would be perfect for a winter wedding. It incorporates darker flowers, making the cake look very elegant. 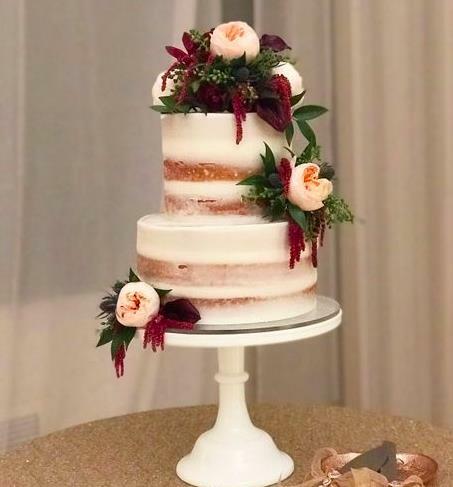 The way the flowers are placed makes the cake look stunning. This is a great option if you are looking for a smaller cake. Picking a cake can be hard, however, it’s also a decision that can reflect your personality and taste! This decision can be fun if you know the options that are available. Look to the website for further advice and help make this decision easier and more fun for yourself. How did you choose your cake? Leave a comment and let us know.